The carrier appears to be conducting a staggered rollout as Wi-Fi calling is not yet accessible by all iOS 9 beta testers, though wider availability is expected in the coming hours. The feature was first discovered last week in Apple's latest iOS 9 beta build. As seen in the screenshots above, toggling on the Wi-Fi calling option in Settings invokes an informational iOS pop-up regarding billing. Clicking through brings up an AT&T splash screen that notes Wi-Fi calling can be used to talk and text in poor coverage areas. Finally, users must agree to licensing terms, which include a warning message saying cellular is a better option for 911 emergency calls, before moving forward with the activation process. As noted by AT&T, the EULA applies to Wi-Fi Calling Trial, suggesting that only a limited number of users have access to the service. 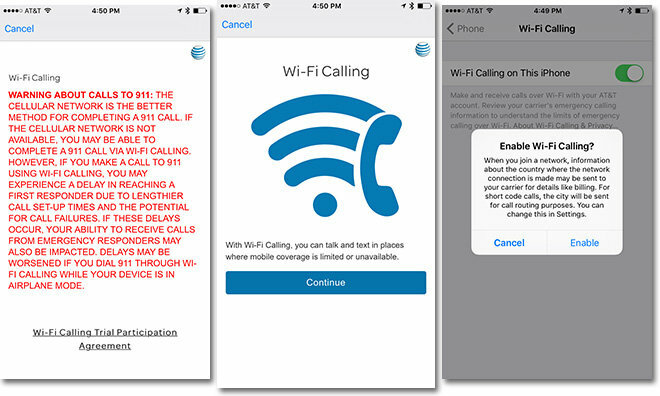 Apple first activated Wi-Fi calling on iOS with support for T-Mobile's network in iOS 8, allowing customers to offload incoming and outgoing calls to a local data network. Using a Wi-Fi backbone aids in call stability and, in some cases, better audio quality. With Wi-Fi calling going live for some, AT&T is making good on a promise to support the feature made shortly before Apple released iPhone 6 and 6 Plus last year.